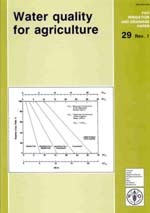 Water Quality for Agriculture was first published in 1976 as Irrigation and Drainage Paper 29. Although many of the basic concepts of salinity control and dealing with poor quality water remain the same, new data and experience have prompted us to revise the 1976 paper in order to keep the user up-to-date. The document is now presented as a field guide for evaluating the suitability of a water for irrigation. Included are suggestions for obtaining maximum utilization of an existing or potential water supply. Guideline values given identify a potential problem water based on possible restrictions in use related to 1) salinity, 2) rate of water infiltration into the soil, 3) a specific ion toxicity, or 4) to some other miscellaneous effects. Discussions and examples are given along with possible management alternatives to deal with these potential problems. This paper is intended to provide guidance to farm and project managers, consultants and engineers in evaluating and identifying potential problems related to water quality. It discusses possible restrictions on the use of the water and presents management options which may assist in farm or project management, planning and operation. The guidelines and discussions are based on reported experiences gained from many farm areas throughout the world, mostly in arid and semi-arid areas. A vast majority of the data has come from agriculture in the Western United States, therefore, caution and a critical attitude should be taken when applying the guidelines to specific local conditions. The guidelines can indicate potential problems and possible restrictions on use of the water but the true suitability of a given water depends on the specific conditions of use and on the management capability of the user. The guidelines should be useful in placing water quality effects in perspective with the other factors affecting crop production, the ultimate goal being to obtain maximum production per unit of available water. Salinity is discussed from the standpoint of a reduction in soil-water availability to the crop. Recent research findings on plant response to salinity within the root zone have been incorporated into the guidelines to improve their predictive capability. Updated crop tolerance values have also become available and are included. A method is presented for calculating the leaching requirement for the crop considering the quality of water available. Values calculated by this procedure, if adopted, represent an appreciable water saving as compared to most older procedures. A water infiltration problem related to water quality is usually associated with both the salinity and sodium content of the water. A procedure is presented to evaluate the potential of a water to cause an infiltration problem based on a combination of its salinity (ECw) and sodium adsorption ratio (SAR). A specific ion toxicity is discussed as to the concentration of boron, sodium or chloride and their effect on yield of sensitive crops. Other less frequently encountered problems are discussed as miscellaneous problems. Tables showing recommended maximum concentrations of trace elements for irrigation water and for toxic substances in drinking water for livestock are also presented. These guidelines are based on various preceding guidelines developed and used in irrigated agriculture in the Western United States. The format follows that used by the staff of the University of California, USA. Many of the basic data and the concepts of saline water use and management have been developed or proposed by the US Salinity Laboratory and the authors would like to express their grateful appreciation for this help, particularly to Drs. G.J. Hoffman, E.V. Maas, J.D. Rhoades, D.L. Suarez, and the Laboratory Director, J. van Schilfgaarde. Drs. R.L. Branson and J.D. Oster (University of California), Dr. J. Van Hoorn (Wageningen), Mr. J.D. Doorenbos (Ministry of Agriculture, The Netherlands), and staff of the Land and Water Development Division (FAO) have been particularly helpful with suggestions and draft reviews. Thanks are also due to: Chrissi Smith-Redfern, Hazel Tonkin, Charlene Arora and Mary Westcot. The paper is dedicated to the field person who must make decisions on the effective use of irrigation water. This paper attempts to take the solution and prevention of water quality problems to the field. The ultimate goal is that of maximum food production from the available supply of water. In running text where symbols are used, e.g. ECdw, for mechanical reasons they have been typed level on the line. However, they appear correctly in the equations where greater flexibility is possible e.g. ECdw.